Gabrielle Bonheur”Coco” Chanel is a mysterious figure whose past is fraught with ambiguity. As my favorite designer, and icon for female empowerment, I’ve done my fair share of reading on Mademoiselle Chanel. When I heard Paul Morand’s The Allure of Chanel was being reissued with illustrations by Karl Lagerfeld, I immediately had to get my hands on a copy. Morand’s The Allure of Chanel stands apart from other books on Gabrielle Chanel’s life because the text is in Chanel’s own words. Mlle. Chanel invited Paul Morand to visit her in St. Moritz so that he could write her memoirs. Morand took many notes on his conversations with Coco on everything from hard work, beauty, wealth, aging and solitude. After the interviews, the notes were stashed away, only to be discovered after Mlle. Chanel’s death. Thirty years after the interviews, Paul Morand published The Allure of Chanel. I read The Allure of Chanel from cover to cover in a matter of hours. Maybe it’s because I’m infatuated with the subject matter, or maybe it was because it will be the closest to hearing her speak in her own words, but I was hooked from the moment I started reading. It’s very rare that you can get a glimpse into the mind of a haute couture and fashion branding pioneer and Paul Morand gives us the opportunity. The illustrations by Karl Lagerfeld at the beginning of each chapter only enhance the experience. If you have any interest at all in Chanel, I highly recommend this book. The Allure of Chanel is available now online. *I received a copy of The Allure of Chanel from the publisher. Anyone familiar with the Chanel brand knows that the Camélia is one of the brands symbols because it was Coco Chanel’s favorite flower. It is said that she was drawn to the flower’s simplicity – with neither scent or thorns – the Camélia’s beauty lies in its perfect order of petals. Chanel has long had fine jewelry collections featuring the Camélia – one of my favorites being the gorgeous time pieces. Now, Chanel introduces Camélia Ajouré – a new collection of striking fine jewelry – all with the Camélia motif. The pieces in the collection feature rings, cuffs, necklaces and earrings in 18K white gold and 18K yellow gold. Some pieces are adorned with diamonds, while others in black onyx and white agate. The most striking pieces feature black and white diamonds – swoon! Most of the pieces are classical interpretations of the Camélia but there is one ring that is a bit more of an abstract design. 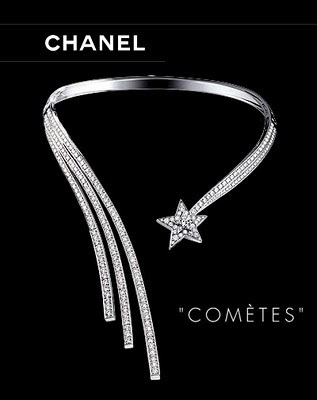 One of my favorite designs is a “remix” of the infamous Chanel Comètes Necklace with a Camélia replacing the star and a singular diamond drop replacing the the 3 strands of diamonds. All of the pieces are gorgeous but since they are fine jewelry they definitely don’t come cheap. For now, I’ll have to settle for the costume jewelry but I can dream can’t I?